Dear WMATA: How much would it cost to erect and tie down a tarp over the Dupont Circle escalators, as compared to the amount of money spent on yearly escalator repairs and maintenance due to weather damage? To my experience, the south exit has never had all three escalators running for more than a week at a time. 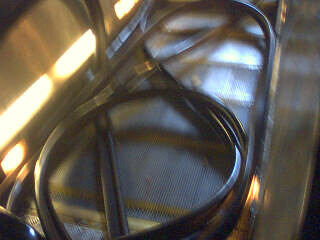 And, in case you were wondering, this is what an escalator’s rubber handrail looks like out of its natural habitat. Photo taken with a Sony Ericsson Communicam attachment (on T300 phone). The same happens on the London Underground. I think in all my years of travelling on it, at least one escalator per journey is always out of action, and they’re all sealed away underground. When riding the Metro, I’ve always wondered why they left the top 1/8 or whatever of the escalator exposed to the elements…bad design. A couple of years ago, designs for canopies for the open air entrances to Metro were approved and even budgeted, but you know how that goes. 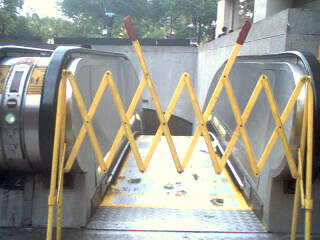 The improvements were probably protested by the escalator repair union.